The use of human misdeeds against the humans. This is common especially among the supernatural enemies. Overly preposterous schemes. Bandora was known for those kinds of attacks. Perhaps the funniest enemy attack has to be when Bandora planned to make everybody sneeze uncontrollably. The use of one's physical beauty. Some of the villains were kind of hot that they would be able to deceive people. The use of fear factor. Some villains found the rangers' greatest fears and used it against them in hopes of securing an easy victory. The abolishing of human necessity. The villains would also target whatever humans need to survive from food to even love. The perversion of positive human emotions. For example, we had monsters causing people to romantically like people. If there was any character in Shinkenger I found interesting yet underrated it was Kaoru Shiba. What made her interesting she is a real heroine female red ranger unlike the arrogant A-Squad leader in Power Rangers SPD. Also, she was the true head of the Shiba clan. While she seemed to be a spoiled brat at the start, she becomes a likable character even if her combat skills aren't as competent as her shadow warrior (who she "adopted" as her son) Takeru Shiba, well I think I like it whenever she silences the real spoiled brat attendant Tanba because he was just so plain annoying, more annoying than Bulk and Skull combined. The Goseigers think that their mission is over but it's FAR from over as far as script writers are concerned. Master Head tells them to think about their future as rangers. Now a new, mysterious enemy appears and it's a tough call. The thing is this reminded me of how the Gaorangers thought Shuten's defeat meant their battles were over until the new enemy Ura showed up to make their lives miserable. 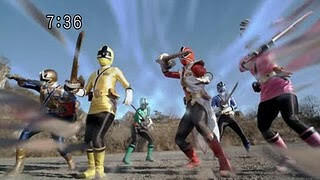 We find out that the Goseigers are attacked one by one by the new enemy. The rangers who are injured are Eri, Moune and Agri. Seeing Eri being attacked first reminds me of Kimberly being attacked in MMPR and well, call me stupid for getting Tommy-Kimberly nostalgia whenever I see Alata getting together with Eri. It's an intense battle with Derepta who managed to survive the last attack. Alata and Hyde fight together to defeat the enemy but he's become tougher than before. Alata decides to fight a desperate battle with Derepta. It's one awesome battle. How do you feel that Saban is returning? 31/51 said it's great (Sentai-PR fans regardless of category), 13/51 said they're neutral (typical I like Sentai more than PR but I don't mind about PR existing maybe?) and 7/51 said "Boo, Hiss". I think those who voted for "Boo Hiss" may be either Sentai purists or Disney over Saban supporters. Which makes better Power Rangers? Not surprisingly 23/42 want Shinkenger while a good number of 19/42 want Goseiger. I just hope Saban decides to use an Asian red ranger for the first and the last time to make his comeback memorable. We've seen so many black and white red rangers, why not a yellow one too? The thing is I believe Dekaranger to be the best 2000s Sentai of all time. Why? Well it seems to be the most awesome series despite the fact NO SERIES IS PERFECT. The thing is it seems there's so little flaws to look down at and more positives to look up to as a Sentai + police drama plot rolled into one. BTW the music really is cool! Compared to typical toku acting where most of the newbies try to act their best (but I don't consider it poor acting either), the cast members were pretty good. I liked how the cast members portrayed their members. I think the best actors have to be Ryuji Sainei, Tsuyoshi Hoshi, Ayumi Kinoshita and Tomokazu Yoshida- they really bring out their ranger characters to life. Oh yeah, the voice of Aburera is REALLY SCARY. 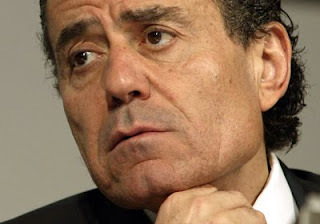 I found him really evil, like he was a real character in daily life despite his powers. Do you think Goseiger is too kiddie? 23/47 said no. I belong to the 14/37 who said yes that it's too kiddie. 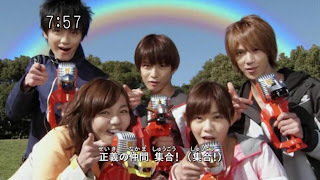 I felt that Shinkenger or even a "Care Bear" Sentai like Magiranger is more mature than Goseiger. Do newer Sentai characters give you PR nostalgia? 30/35 said no. Only 5/35 said yes. Well that's that. For me, some of them do, some of them don't. Ha ha. Goseiger 15 presents the end of Warstar or is it? Mons Drake unable to accept any more defeats together and with his sidekick Bladerun decide it's their final battle against the Goseigers. Things look grim as Bladerun pilots their battleship Invader in an attempt to destroy the Goseigers, storing the Earth's oxygen hoping to blow up the Earth. This creates a terrible situation nearly killing the planet. It's one big giant battle that finishes them both or is it? 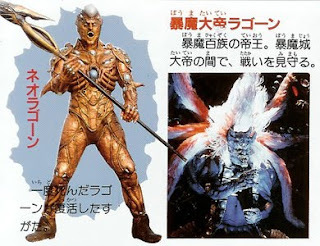 Well if you remember Gaoranger, Org Highness Shuten was destroyed quite early and a new enemy appeared an episode after. On the other hand, Bladerun might have escaped. Who knows? However it's too early to celebrate as the next episode presents a new enemy- is he a remnant of Warstar? Is there a more powerful enemy in store for them? Stay tuned! I hope Goseiger doesn't become too short! 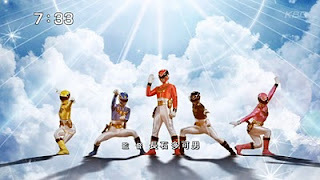 Why I Love Super Sentai as a Tokusatsu? The thing is okay, maybe I do point out mistakes but you can't love without pointing out the mistakes can you? It's out of concern for the franchise I'm doing it, not to put down the franchise. The concept of all for one like the three musketeers. Despite differences and weaknesses, they acknowledge the God-given differences are meant to make them into a team. Struggles are shown and how a team gets stronger as they go through their lives. A more diverse villain cast (most of the time) in the battle between good and evil in a world gone crazy. Some villains can range from just being plain ambitious to vengeance ridden, whatever the case they make the plot interesting rather than not showing their pitiful side to teach the lesson that being a victim doesn't give one the right to make victims. Having a cast of likable characters most of the time. There's a whole load of action in battle. The thing is I was kind of thinking that Goseiger must be getting stale. Why? First we see Dereputa of the Meteor (correction) die in episode 12 after Mons Drake tries to destroy the Earth. Now in episode 15, we have the upcoming demise of Mons Drake and it seems Bereduran is either going to take over for the rest of the series or is there something behind the scenes. Looks like Goseiger will have new villains and I think that Rikiya Koyama may appear in the flesh as a new enemy general or maybe, even Tetsuo Kurata of Black RX fame despite the fact they've aged. There's a little Earth and Sea situation between Hyde and Moune. So okay they really don't get along at the start of the episode. The thing is Hyde is always belittling Moune during the start as she is the youngest member. Hmmm... lover's quarrel? They are forced to work together when Tageito of the Satellite traps them into a blank dimension, which however by working together they do escape to be able to assist the others to defeat the monster of the week. Of course it's never without the overprotective big brother in Agri when he loses his little sister for awhile. Next week... it looks like Mons Drake is going out. So far we'll have to see. If you remember Shuten of Gaoranger, he died in episode 14 at the hands of Gaorangers and was taken over by another Highness Org. Will the same fate happen to Mons Drake? I kind of have a theory that there is a greater power behind the Warstar empire, perhaps a hidden villain or will he resurrect? 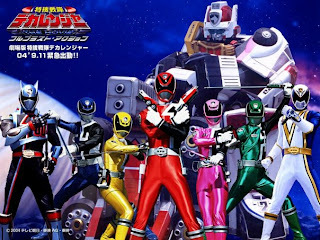 I think it's time to spotlight on what a Shinkenger as Power Rangers adaptation is and I think the name Sword Dynasty will fit better, seeing that when the Shinkengers morph, they spelled out Chinese characters, maybe and just maybe, Saban can ignore it be Japanese and change it to Chinese (he just LOOOVES Korean and Chinese rangers) or just get it to Japanese. Oh yeah I suggest show Shinkenger first before this! 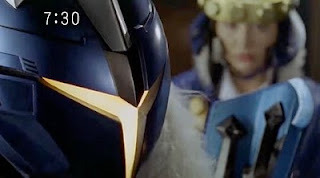 Plot: A peaceful empire known as Styx is usurped by the vicious Emperor Gedor (Emperor Doukoku in Shinkenger) and corrupts it and now seeks to conquer Earth after the defeat of its previous emperor at the hands of the Lee Shan clan. The Lee Shan clan however runs into the martial artist/scientist Samuel Hung (a character based on Maskman's Sanjoru Sugata) who trains the clan's 18th generation head Michael, holds a competition which gathers four non-Asians who were hesitantly appointed as rangers. Now they must gather together to stop the empire. Do you find Shinkenger to be way overrated? It's a close battle with 31/59 saying yes, 28/59 saying no. Close battle really. Are you looking forward to the Shinkenger special? 45/56 said yes, 11/56 said no. Hmmm people do like Shinkenger huh? How do you find Datas' morphing? 31/39 said awesome, 3/39 said not a very good plot and a 5/39 want to dismantle him. Those who answered the last option are cruel. What weakness do you think is present in 2000s Sentai? 20/47 thinks it's just fine (hate it when people refuse to point out the mistakes to improve it), 11/47 47 said too much CGI which is true at times, 8/47 says too much mecha in some shows, 4/47 voted for both lack of seriousness and lack of civilian action scenes. Only if people just voice out their improvements. Do you think Goseiger needs to liven up the plot? 27/33 say yes, 8/33 said no. 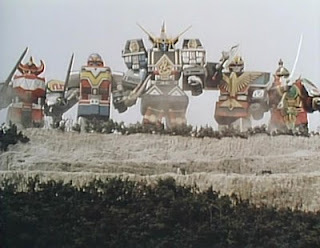 When this picture leaked out to PR fans who didn't know much of Super Sentai and that MMPR was drawn some Sentai sources of Zyuranger, Dairanger and Kakuranger were confused, "I don't remember Fiveman and Jetman assisting the Power Rangers or wasn't the Thunder Megazord dismantled before the Shogun Megazord came as well as Dino Megazord." Actually it was until they discovered of the short TV special Super Sentai world that they knew that MMPR was NOT an original production by Saban but an adaptation with royalties to Toei, as Toei's means to target America because of cultural differences. Somehow it had crossed my mind that perhaps, maybe in Boukenger, there was some attraction between Yaiba and Shizuka before his treachery. Maybe there was... after all they were sort of like Grey and Maria except Yaiba was a darker Grey with a more intense rivalry with a black ranger, Shizuka was only like Maria in terms of using disguises and being well, Yaiba's partner. Yaiba was as cold as as steel, the steel that forms his armor and he had a partnership with Shizuka whom he may have attraction to and she to him.